As one of the largest wastewater and water providers in the United States, Aqua America delivers services and wastewater management, and leading financial, technical, engineering, environmental, and compliance knowledge to ensure each Aqua-owned system delivers exceptional service. Municipalities that are interested in learning more about water privatization in Georgia or Georgia wastewater treatment are encouraged to fill out the Contact Us form on this page. Aqua delivers water services to more than 3 million people across this country, and our employees help to preserve and improve water systems throughout their lifecycle: design, construction and operation. Aqua provides 24/7 response in the event of a water quality service interruption or concern. 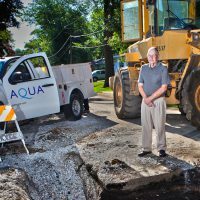 Additionally, Aqua proactively finances and funds in infrastructure, replacing and installing pipes, valves and hydrants to keep water flowing to the homes and communities it serves. Aqua can provide remote system monitoring services and will send expert, licensed staff to address instant needs and perform emergency or preventive maintenance to ensure water dependability and quality, night and day. Aqua wastewater treatment can help Georgia cities and towns by improving and maintaining sewer systems, which helps to convert wastewater into safe water suitable for discharge back into the environment. Through partnership with Aqua, local communities are able to achieve sustainable wastewater management. Aqua provides treatments to ensure wastewater systems are in compliance with state and federal environmental standards. Aqua hires fully-licensed operators with technical proficiency to safely install wastewater infrastructure. Contact Us to Learn About Our Water Company, and Privatizing Water in Georgia. Aqua America pays close attention to the established and quality of infrastructure for water and wastewater systems. Like other private utility companies in Georgia, Aqua is skillful in water and wastewater management, with accomplished employees who are educated in upgrading old systems and ensuring they meet state and federal regulations. If you are a municipal leader and would like to learn more about privatizing water in your Georgia municipality, contact us now by filling out the form on this page. Aqua prides itself on the superb water service it provides to communities, and looks to help water companies in Georgia. Aqua has a range of solutions for municipalities looking for private utility companies in Georgia. Focus – Aqua’s focus is purely on water, whereas municipalities who manage their own water system have to balance the needs and budgets of many priorities in addition to water. Knowledge – As a private water company, Aqua has the expertise and knowledge to improve and maintain existing water systems. Aqua puts its customers first, committing to creating cleaner environments and consistent service. Aqua customizes each system to cater to its customers and recognizes wastewater treatment in Georgia operations must be tailored to a municipality’s unique needs. Personal – Aqua pays excellent attention to updating wastewater services to best meet a community’s needs. Expertise – With more than 130 years of experience, Aqua has developed skills to maintain and improve upon wastewater services in an environmentally-conscious way.